The NSF REU Program in Medical Informatics (MedIX) at DePaul University and University of Chicago enters its twelfth year. We are looking for bright undergraduate students to get involved in research in the area of Medical Informatics for the summer of 2016. Participants will receive a stipend of $5,000, travel support to/from the REU site, and subsistence allowance. 21% of student are in, or have finished, medical degrees; of those, six are active in research. For the application form and additional information, please have your students visit the MedIX website at http://facweb.cdm.depaul.edu/research/vc/medix/index.htm or contact Dr. Daniela Raicu at draicu@cdm.depaul.edu. Summer School for Computational Genomics, June 13-24, 2016. 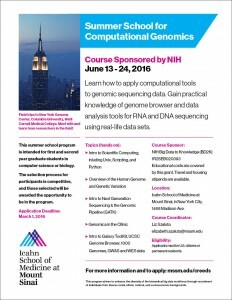 The Icahn School of Medicine at Mount Sinai is currently accepting applications for the Summer School for Computational Genomics, June 13-24, 2016. The application deadline is March 1, 2016. 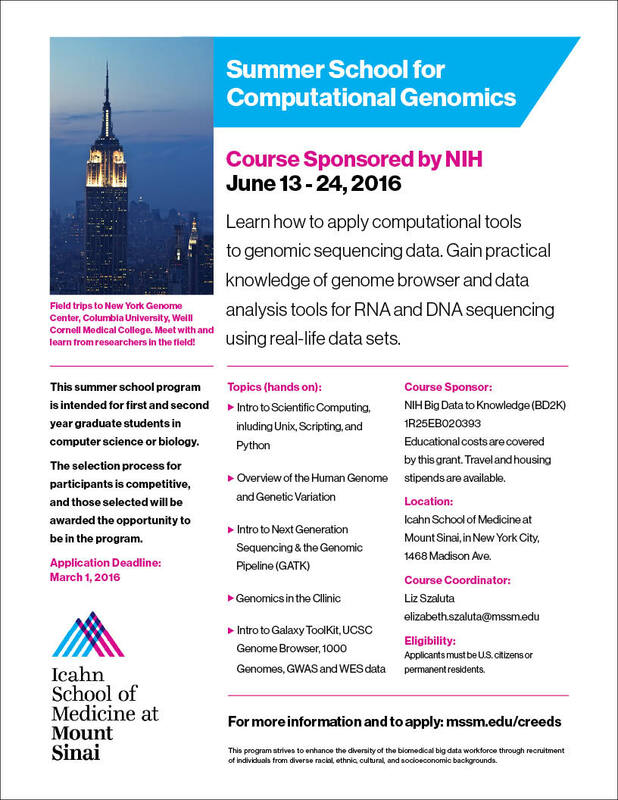 Description: Summer School for Computational Genomics – The Icahn School of Medicine at Mount Sinai (New York, NY). Our big data science summer program from June 13-24, 2016, is designed for graduate students and professionals who have a strong interest in the intersection of computer science, genetics, and medicine. There will be sessions on the human genome, genetic variation, and genome technologies, and there will be introductory sessions on Unix, Python, Galaxy Toolkit, and scripting. There will also be field trips to New York Genome Center, Columbia University, and Weill-Cornell Medical Center. This program is funded through NIH grant Big Data to Knowledge (BD2K) 1R25EB020393. Educational and housing costs are covered through this grant; travel stipends are also available. The selection process for participants is competitive, and those selected will be awarded the opportunity to be in the program. For more information and to apply: http://icahn.mssm.edu/creeds. Applicants must be U.S. citizens or permanent residents. This program strives to enhance the diversity of the biomedical big data workforce through recruitment of individuals from diverse racial, ethnic, cultural, and socioeconomic backgrounds.